Long before I considered becoming Catholic—during the time, in fact, when I considered myself to be anti-Catholic—I found myself drawn to the study of biblical typology. Typology describes a certain approach to the reading the Bible. When Christians read typologically, they discern in the Old Testament “types” that prefigure a fulfillment in Jesus Christ. Isaiah spoke of a man of sorrows, and all Christians since the first generation have seen his oracle as a foreshadowing of Our Lord’s suffering and death. Similarly, the Passover lamb is seen as a prefigurement of the sacrifice of the cross. These are Old Testament types that the New Testament itself draws our attention to. It’s a very ancient method of approaching Scripture. We Protestants, however, were ambivalent about it. On the one hand, we saw that the Apostles used typology. Saint Paul spoke of Adam as a “type” of Jesus (Romans 5:14). Saint Peter spoke of the ancient flood as a figure of Christian baptism (1 Peter 3:20–21). The Letter to the Hebrews presented the old Law as “a shadow of the good things to come” (Hebrews 10:1). The Gospels presented Jesus as a new Temple, a new Solomon, and a new Moses. On the other hand, modern interpreters seemed not to know what to do with typology. Some of them—we called them “hyper-typers”—read the Old Testament imaginatively and found types buried everywhere. But there was no discipline or coherence to their accumulated symbols. The associations often seemed arbitrary. But … it was widely understood that certain typologies were off-limits—like any Old Testament figure (manna, showbread, Melchizedek) that the Catholic Church saw as a foreshadowing of the Eucharist. I loved the Bible and read it hungrily; and now, as I read it with Justin, Irenaeus, Athanasius, and Jerome, I read all the Scriptures as a single book, a masterpiece carefully composed by a divine author. The sense was there in the words as well as the events they described. In the writings of the Fathers, I found not a riot of correspondences, but a single fabric of creation and history, woven by the Creator according to the pattern of His providence. As much as I cherish the discoveries I made, I made them slowly and with difficulty, over the years that followed. How I wish I’d found a single volume that presented this method to me in a comprehensive way. Now, more than thirty years later, I’m pleased to say, I’ve found such a volume. And so I’m even more pleased to say that the Saint Paul Center is bringing it out through our publishing arm, Emmaus Road. 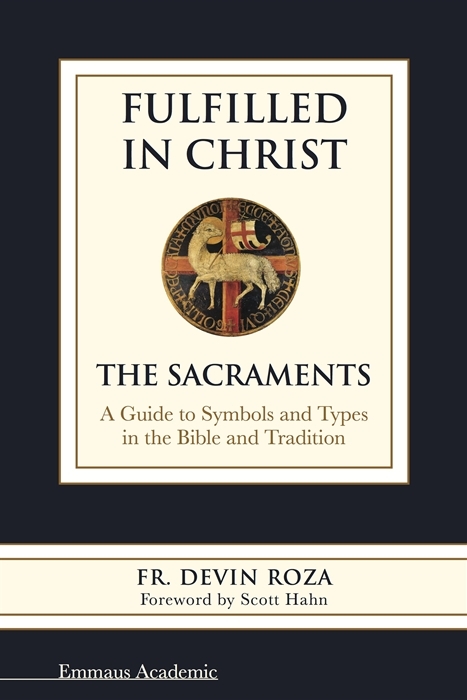 The book is Fulfilled in Christ: The Sacraments: A Guide to Symbols and Types in the Bible and Tradition; and it’s written by Father Devin Roza, who teaches Scripture at Rome’s Pontifical University Regina Apostolorum. In this volume, Father Roza considers each of the seven sacraments and, using the great interpretive tradition, he demonstrates how God prepared the way for each, with prophetic oracles and saving events. Thus, the creation story begins with the Spirit descending upon the waters. Noah guides his ship to salvation through water. The exodus proceeds because Moses strikes the rock and draws out water for refreshment. Ezekiel sees waters flowing from the right side of the Temple and bathing the earth. And Isaiah bids all his hearers to come to the water. And then, in the fullness of time, salvation came to earth by way of the waters of baptism. You can Purchase Fulfilled in Christ Here. Each of the sacraments arrives at the culmination of a similar story, as old as creation. That’s the exciting story Father Roza tells in this book, which, I predict, will help to speed many souls (like me) on their way to the fullness of Catholic faith. “Do not think that I have come to abolish the law and the prophets; I have come not to abolish them but to fulfill them” (Matthew 5:17). Every Catholic knows this truth. It marks the structure of the readings we hear at Mass every Sunday. Let’s tell the world, once again, the story as the Apostles told it, and the Fathers after them. I thank you for all you do to help us tell the story—to help us publish books like Father Roza’s. Without your prayers, your encouragement, your donations, we could do nothing.